This is a 2+ hour walking tour where your Voodoo Historian will bring you to real Voodoo Temples, old Catholic churches, and ancient haunted cemeteries containing the tombs of infamous Voodoo Queens. This is one of the most popular tours in the city and since yours is private, you will get special access to speak to some of the Voodoo priest and priestesses if you dare! Voodoo (or voudou) is a Haitian folk religion which consists of various African magical beliefs and rites that have become mixed with Catholic elements. The origin of the word “voodoo” means “spirit” - an invisible, mysterious force that can intervene in human affairs. 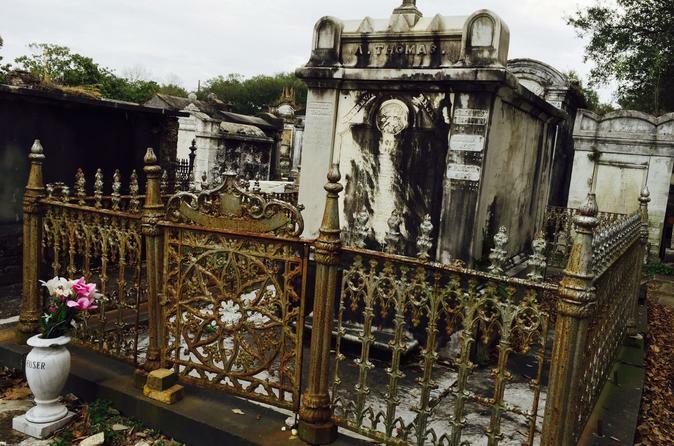 During this tour, you will make your way through the historic French Quarter to St. Louis Cemetery No. 1, the final resting place of history’s most revered Voodoo Queen, Marie Laveau. Guests will have the added bonus of visiting a Voodoo museum and will have the opportunity to purchase Voodoo "magic" potions at Marie Laveau’s Voodoo Shop before heading into the cemetery. There are three St. Louis Cemeteries in New Orleans, but the oldest extant cemetery in the city is St. Louis Cemetery Number 1 and is still the site of several burials a year. Here you will notice that the cemetery's graves are above ground tombs, referred to as “Cities of the Dead" because they resembled small houses and look like a city in itself. To ensure the historic preservation of this local landmark, recent rules set by the Catholic Archdiocese of New Orleans require all visitors to this cemetery to be accompanied by a licensed tour guide.